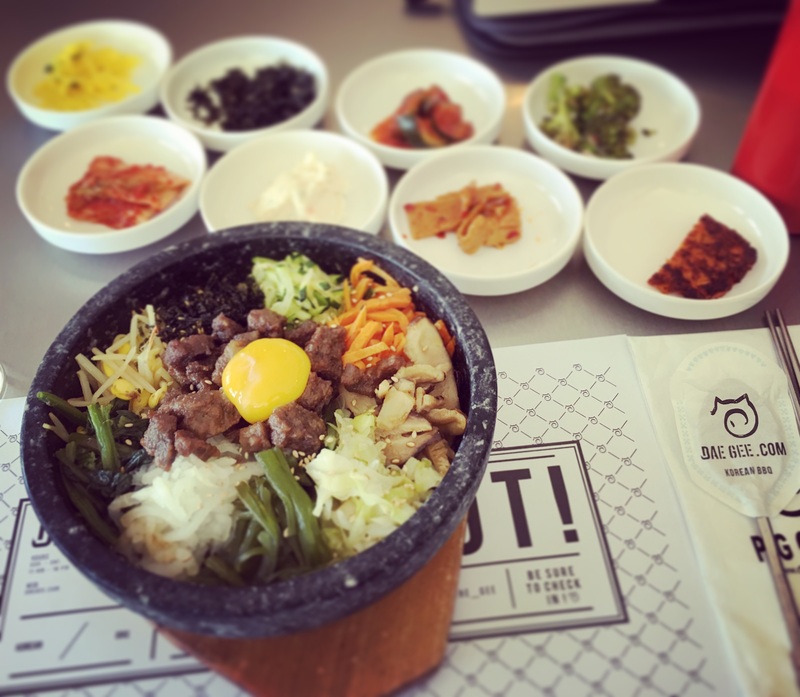 For the last week I’ve been salivating over the thought of the bibimbap I had for lunch at Dae Gee on South Broadway. You know how great the experience of going to a Mexican restaurant, ordering fajitas, and having the iron plate come out sizzling hot and ready for your enjoyment is, right? Those are usually very tasty, but that sizzling typically ends after a minute or two. This piping hot clay bowl of rice, vegetables, beef short rib, and an egg, filled to the brim literally sizzled my entire meal; the bowl was that hot. And it was delicious. And it was accompanied by eight(!) side dishes. And at $12 all-in, it was a steal. Dae Gee is a Korean barbecue restaurant with three locations in the Denver metro area. The name of the restaurant means pig, and its owners want you to pig out. The restaurant is known for its all-you-can-eat barbecue which guests cook themselves at their tables at the reasonable price of $17-22/person depending on the protein choice. Dae Gee was recently featured on the Food Network show Diners, Drive-In’s, and Dives: Tastes of Asia with Guy Fieri. The clip below gives you a good taste of what you’re in for if you pay Dae Gee a visit–something I will be doing again very soon! Dae Gee has three locations in the Denver metro area: at 8th and Colorado, 4th and Broadway, and 75th and Sheridan.